South Africa trailed 19-0 after a first half that was completely dominated by Fiji, but turned the match around after half-time, matching Fiji’s three tries and snatching the win with the last-gasp goal. 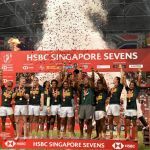 In doing so, they stopped Fiji backing up its win in last week’s Hong Kong Sevens and becoming the first team to win the Singapore title in consecutive seasons. They beat Fiji for the first time in their last four finals meetings and shook up the overall World Series standings. South Africa’s coach stirred up his young players during the half-time interval, and they were a different team in the second half, eliminating errors and playing with much more focus.